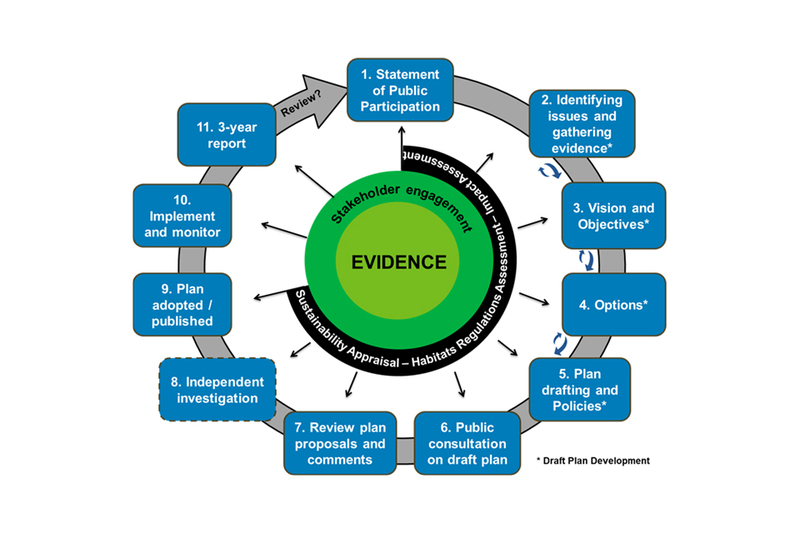 The 12-stage process on how a marine plan is made from selection to implementation and monitoring and how you can get involved. If you would like more information about marine planning please email planning@marinemanagement.org.uk. MMO engages locally to agree who will be involved in the plan production process, and when and how this will happen. The Secretary of State must approve the Statement of Public Participation (SPP). The process of collecting and analysing scientific data begins in consultation with interested parties. A marine plan must be built on a strong evidence base, and a thorough understanding of the activities and resources in a plan area. MMO will publish a summary of issues and evidence for each plan area, this is the foundation on which a marine plan is developed. When collecting evidence for a marine plan MMO focuses on the priorities identified in the Marine Policy Statement (MPS). These activities will be assessed against economic, social and environmental considerations. MMO prefers data in a geographic information system (GIS) format where possible. If you cannot provide your data in GIS format, it can still be considered, but it may take longer to incorporate into the marine evidence base. We already hold a significant level of data and evidence on the English marine area, gathered from a number of existing sources to support marine planning. This information can be viewed on the Marine Information System (MIS), which displays the appropriate marine policy documents for all of England’s marine plan areas in an accessible online, quick reference format. You can find and zoom in on particular areas or activities of interest - from wind farm developments to conservation areas. You can submit data using the online evidence submission form and email it to marineplanningevidence@marinemanagement.org.uk. MMO will assess the data and respond within 20 working days. You can email evidence if the electronic file is 15 MB or less, or send it by post as a CD or DVD. Additionally, lessons learned and evidence produced in previous marine plan areas is considered in future plan making. These objectives will be delivered in all marine plan areas through a variety of means, but principally by developing marine plan policies to address the issues facing their achievement. The vision for each marine plan area is developed after engaging with stakeholders with an interest in the area. MMO considers different ways of achieving the plan objectives and vision, to make sure that the choices made and their implications have been considered. Some elements of this process, such as the sustainability appraisal are legally required as part of the planning process. A sustainability appraisal allows MMO to assess how a marine plan will affect environmental, social or economic sustainability. A Habitats Regulations assessment will form part of the appraisal process. The MMO considers it best practice to present draft options for issues in each marine plan area, summarising how the objectives and vision are proposed to be achieved, as part of the stakeholder engagement process. The process of marine planning has been updated for the north west, north east, south east and south west marine plan development. An iterative process is the process of getting to the desired end result by means of repeating cycles of operation. This allows us to repeat processes which lead to the formation of draft policies and re-visit stages in the planning wheel as and when required. Following the options stage, plan policies are developed. Applying the policies in the plan should help to achieve the vision and objectives. Policies inform decisions about applications, licenses and authorisations (things that require approval) and enforcement. Policies are written to take into account existing legislation and obligations at national and international level. This includes those within the Marine Policy Statement and Marine and Coastal Access Act 2009. Local land-based plans are also considered. MMO produces the draft marine plan and presents it to the Secretary of State, together with the draft sustainability appraisal, for approval to be published for consultation. At the end of the consultation, MMO analyses responses and produces a summary report. Those who submitted responses are notified of publication of the report. If substantial unresolved issues remain after the consultation process, the Secretary of State will consider whether an independent investigation is required. If so, the Secretary of State will appoint an independent person, likely to be the Planning Inspectorate, to investigate the unresolved issues. It would aim to complete its report within 6 months. See a brief guide to independent investigations. The plan is reviewed and amended as necessary in response to comments and the investigation report (if applicable) is then presented to the Secretary of State for approval and adoption. MMO must review and monitor the effectiveness of the plans and related policies every 3 and 6 years. If a review shows that changes are required, steps will be taken to do so, with further public consultation. MMO will produce and publish monitoring reports and plan reviews (if needed). For more information, see ‘How do I get involved in marine planning’. Each marine plan area has a Statement of Public Participation (SPP) that sets out who will be involved and how and when this will happen. The SPP for each plan is approved by the Secretary of State at the start of the planning process. An interactive tool – the Marine Information System – explains how marine plans apply to different marine sectors and geographic areas. It highlights policies that apply to a chosen area to inform plan users, and mapping information makes searching for your area of interest easier. 11 June 2014 First published.